In the late 19th century, the idealistic, dramatic, and personal writing style of the Romantic era was replaced by the Realist style that removed the “self” from the narrative and returned to the more empirical tone last seen during the Enlightenment. An example of Realist writing is seen in the 1919 article by Justice William Renwick Riddell, entitled “The Slave in Upper Canada”. In it he absented himself from the text and used Realist language, frequently referring to the “law” and “court”. Gone are the heroes and rescuers of Romantic writing, as well as any references to God. 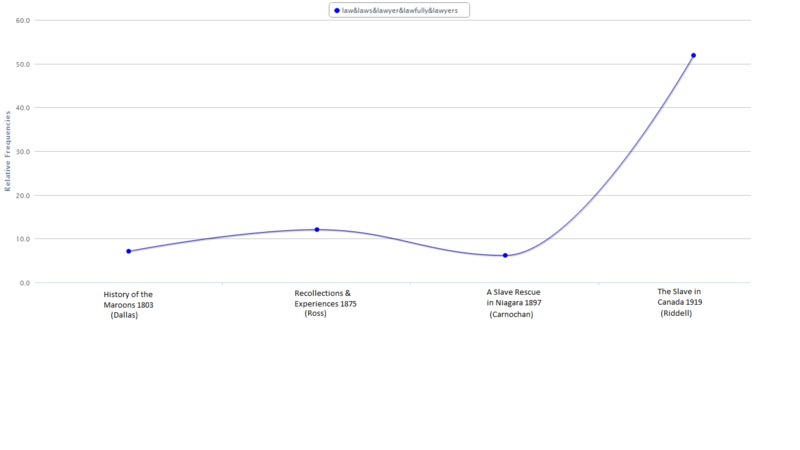 Graph showing Justice Riddell's use of the word law in his 1919 "The Slave in Upper Canada"
Through this period, Blacks in Canada were free under the law, and were not in danger of being taken back into slavery. Those who had wanted to return to the U.S. were gone. Those who remained were no longer fugitives or African-American diaspora. They were Canadians who were committed to their country and they contributed. 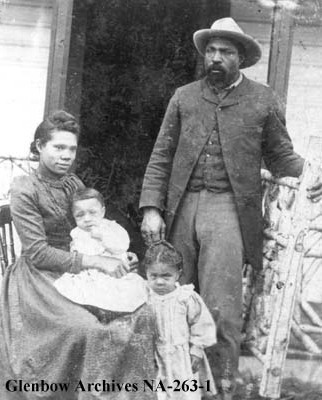 John Ware, known as the “Texas Cowboy”, was born into slavery in South Carolina, but made his way to Texas and then Alberta where he became a successful cattle rancher. He is remembered for his skills at riding and training horses, and for having brought the first cattle to Alberta, thereby helping to launch the important beef cattle ranching industry in Alberta. 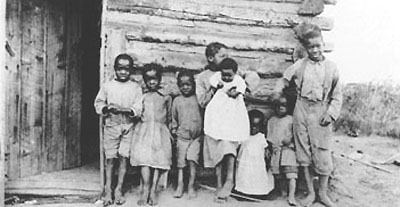 In 1911, over a thousand Black people immigrated to western Canada, including 200 who came to Amber Valley, Alberta. They left the U.S. because of the restrictive “Jim Crow” laws. Canadian law set up economic, health and moral barriers to entry, but these immigrants were able to meet or exceed all the requirements. While they experienced racism in Canada, and had to deal with the harsh climate, most were able, over a few years, to start to build successful farms and were accepted into local social and farming organizations. In 1916, Jeremiah “Jerry” Jones, from Nova Scotia, fought in WWI at the Battle of Vimy Ridge. Jones was “posthumously” awarded the Canadian Forces Medallion for Distinguished Service. But he didn’t die in battle. He died in 1950 but the award of his medal did not happen until 2010. But Blacks in Canada did not always accept the day-to-day racism that they encountered. They began to fight for their civil rights. We tend to think of the Black Civil Rights movement as being in the 1950s and 60s. 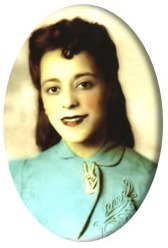 But entrepreneur, Viola Desmond began her fight in 1946. A decade before Rosa Parks refused to give up her bus seat in Alabama, Viola Desmond refused to give up her seat in the “white” part of a movie theatre in Truro, Nova Scotia. She was hauled out, injured, thrown in jail and charged. She fought the charges all the way to the Supreme Court of Canada, and although she lost her case, segregation was outlawed in Nova Scotia in 1954.